The Moscow Design Museum has opened with an exhibition of Soviet post-war design: hoovers, cameras and cars, among other things on display. The exhibition also presents products that were released in massive quantities onto the consumer market, as well as projects which never went beyond the design stage. 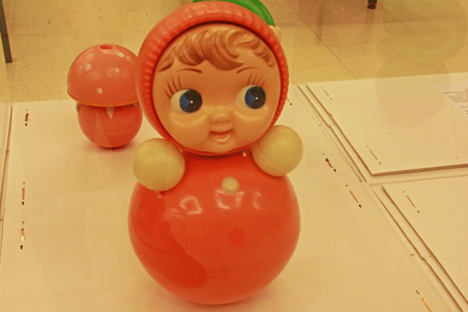 The exhibition of Soviet-era design in Manezh. Source: Daria Donina. The exhibition presents old hoovers, cameras and irons, not just as clutter around the house, but as the result of the innovative work of Soviet artists and constructors, whose efforts have finally been remembered and recognized. The entire history of Soviet-era design (if you replace the Soviet term "artistic design" with this word) is full of contradiction. The exhibition combines the mass-produced goods that were released by the millions with the products that can be called one-of-a-kind. A factory-made dress is made from material produced at the Krasnaya Roza factory, and the next exhibit is a custom-made suit. On one side there are record players with basic “paper” speaker cones, and next to it there is brilliant, professional audio equipment that makes use of space technologies and mock-up audio technology from the family of the Petersburg designer Nikolai Slesarev —these projects were never actually realized. This is the second problem the exhibition draws attention to: the ideas that came to fruition, and the projects that stayed in the desk drawer, and the fact that there are many more of the latter. There are objects that are completely unexpected. Some things people were able to make, and others remained ideas that never reached fruition (model exhibits). Finally, the exhibition points out the anonymity of the inventors. Even though the objects were often produced en masse, no one knew the names of the designers or people who developed them. In the best cases, the name of the construction bureau was the only thing known. The design museum invested much time and effort into finding out the names of the artistic designers, and many of them were recorded in video interviews that will be shown at the exhibition. Amongst them, for example, is Yuri Soloviev, one of the pioneers of industrial design in the Soviet Union: right after the war he was asked to design the interior of the economy class carriages on the Russian railways. There is also an interview with Vladimir Runga, the constructor of the Krasnogorsk optical-mechanics factory, which released the very competitive Zenit camera. Another hero is Valery Akopov, a graphic designer who developed a pictogram system in 1980 for the Moscow Olympics. Svetlana Mirzoian from Riga, Latvia took part in developing the RAF minibus (which in Soviet times was used as an ambulance and for other public services) and designing household products such as hoovers and lamps. “Now it turns out,” said exhibition curator Alena Sokolnikova, “that the principles of Soviet technical design are very close to the contemporary Western concept of eco-design, which is about much more than just the harmoniousness of outer form and the use of natural materials. “We want to show that Soviet design does not end with the avant-garde and constructivism,” said Alexandra Sankova, director of the Design Museum, to RIA Novosti. In the future, each of the sections of the museum looks set to turn into separate exhibitions — fashion, Soviet design for children, leisure and hobbies. According to Sankova, despite the fact the exhibition has only just opened, it has already generated interest abroad — projects like this have not appeared anywhere else. It has already been decided that, after Moscow, the exhibition will be put on display in Eindhoven as part of the Russia-Holland year. First published in Russian in Kommersant Weekend. The exhibition will be held in Manezh Exhibition Hall in Moscow (Manezhnaya street, 1) till Jan.20.